Jaipur, along with Agra and Delhi, form three vertices of the “Golden” (read: “Bermuda”) Triangle from which most tourists never escape during their entire stay in India. Since we seem to be in a spree to check off the beaten path, we had to cover the Golden Triangle to even start looking at the said path menacingly, let alone thrash the hell out of the poor thing. Now that Delhi and Agra have been swept aside, we decided to finish off the triangle. Thanksgiving week of 2012 saw us taking the 24 hour bone-rattler (popularly known as the train) which brought us from the pink of our health to a slightly disoriented state, but more importantly, it brought us from Pune to Jaipur. We spent all of the first afternoon convincing our body that earth is no longer shaking underneath it. We started our sightseeing early (well, as early as Jaipur will allow us to – nothing here opens before 9 am) with a trip to the old city. 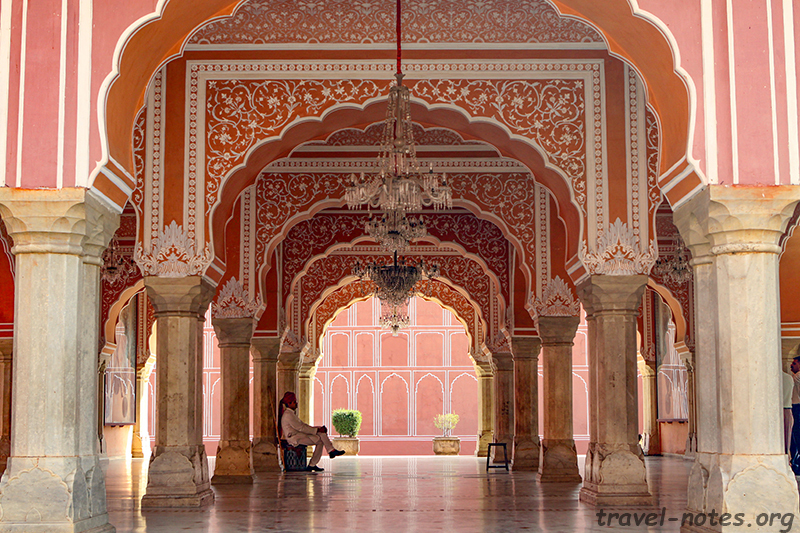 The old city was (and still is) painted pink through and through by the orders of Maharaja Ram Singh in order to welcome King Edward (then, the Prince of Wales) – no, neither of them were gay, and yes, pink is also the colour of hospitality. 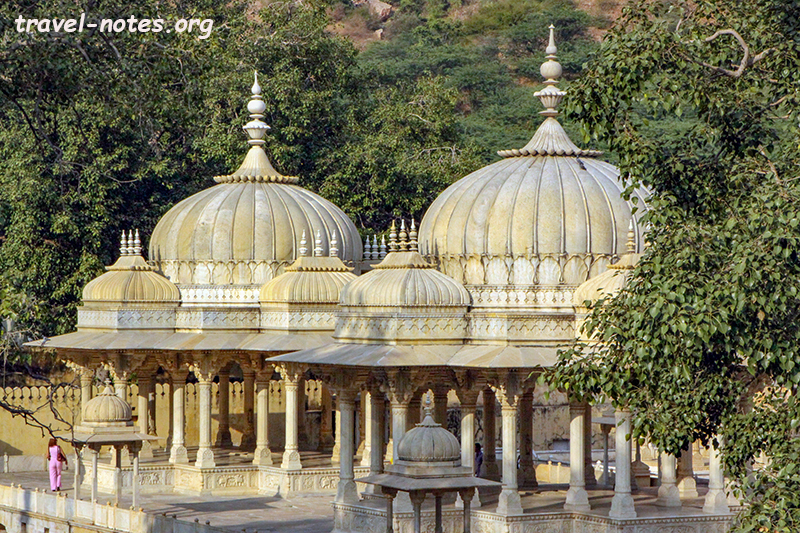 Jaipur rulers were pro-establishment (marrying into the Mughals and supporting the British heavily) which resulted in their wealth and well preserved palaces and forts. 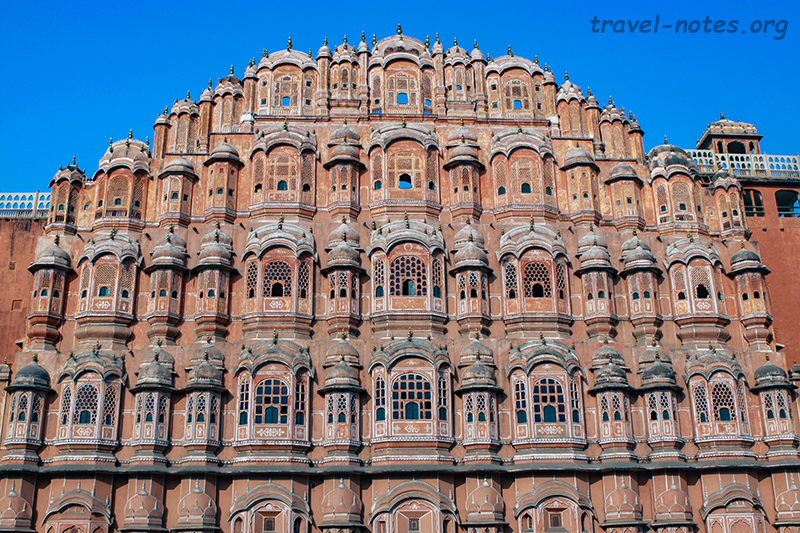 The most iconic structure in the old city is the Hawa Mahal (Palace of Winds), a honey combed palace that Maharaja Pratap Singh built in 1799 for the royal ladies to ogle at the city crowd without being ogled back at. After taking the standard picture of the structure with the ugly Jaipur traffic in the foreground, we checked out its interiors. The next stop was Jantar Mantar, the last (and the best preserved) of the five astronomical observatories that Jai Singh II built around the nation. It houses the world’s largest sun dial (with an accuracy of 2 seconds) and is rightfully celebrated as pinnacle of scientific achievement of the nation in 18th century. However, half the instruments in there catered to Astrology. So hundred years after Tycho and Johannes (Brahe and Kepler, in case you don’t know them on a first name basis like I do), scratched their heads about Venus and Saturn, our people were hung up on Virgo and Sagittarius. Right across Jantar Mantar is the City Palace where the descendants of the Jaipur Maharajas are still living happily ever after. In order to fund the happily bit, they have magnanimously opened a part of the palace for the public. Royal garment collection, bright pink Diwan-E-Khas, the sumptuous Pitam Niwas Chowk with the four stunning gateways representing the four seasons were all as grand as the guidebooks describe. The pick of the lot was the two man-sized silver vessels (largest of its kind in the world) that Madho Singh commissioned for carrying Ganga water on his trip to UK as he was convinced that the Brits only drink beer. Jai Singh, the builder of Jaipur and Jantar Mantar, also built a couple of forts, one of which, the Nahargarh, was built to protect the city. The fort is placed precariously on top of a ridge overlooking the city. A 45 minute bumpy auto-ride brought us here. The views were expectedly quite impressive; the murals unexpectedly so. 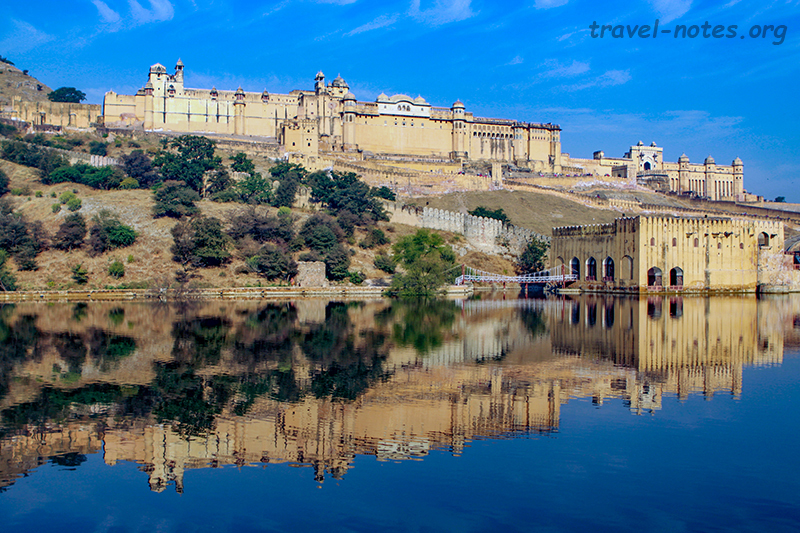 On the second morning we headed to the highlight of our trip, Amber Fort, the capital of the region till Jai Singh II decided to build Jaipur. Although a fort is said to have existed here since 1036, everything that we can see today goes back to 1592 when Man Singh ordered the construction of a new fort at this site. Man Singh, Akbar's brother-in-law and commander-in-chief, was most famous for defeating his fellow Rajput, Rana Pratap, at the Battle of Haldighati. With a lake in front and hills on all three sides, Amber presented us with quite a stunning sight from the outside. It was equally matched from the inside as well by the intricately painted pols (gateways) and especially by the glittering Sheesh Mahal (Palace of Mirrors) with its thousands of tiny mirrors adorning its walls. On the ridge overlooking the Amber is Jaigarh, a fort which boasts the world’s largest wheeled cannon and a view of Amber to die for. Amber’s blue print – spectacular monument in a valley surrounded by hills has been replicated in three other places in Jaipur – the intricately carved royal cenotaphs, ancient Galta Mandir (mandir = temple in hindi) and a garden dedicated to the Queen of Man Singh. We spent the following day checking out these sites and endlessly arguing which amongst these was the best. Somehow in between all this, we also managed to visit the city’s Central Museum – the building that houses it was quite gape-worthy; the collection, not so much. The bone-rattlers between Pune and Jaipur only ply on certain days of the week. 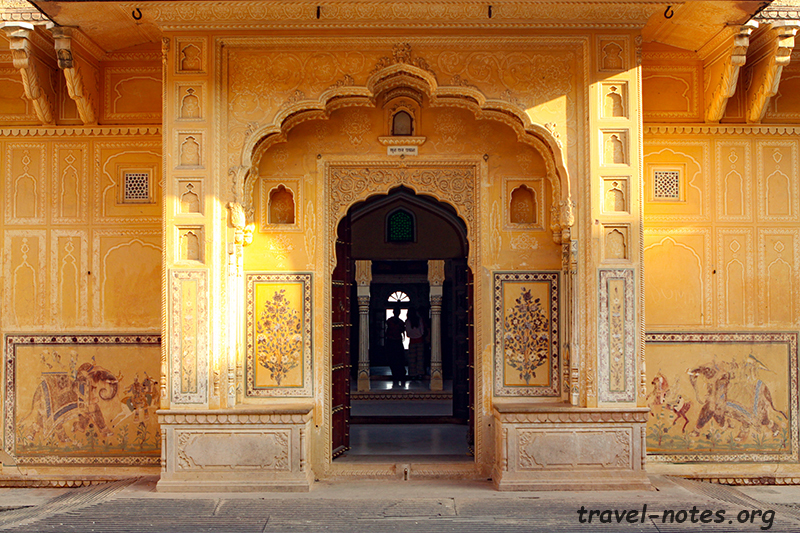 The result was that we had a day to kill in Jaipur and an urge to escape its stifling traffic. Consulting the bible and figuring out a millennia year old step-well within a 100 km radius was the easy bit. Convincing a taxi driver that we preferred to gape at a hole in the ground instead of shopping for carved elephant teeth was the challenge. We eventually managed to sweet talk a driver into taking us to the destination. We found the 5 hour trip to spend an hour at the well worth the effort; so I conclude that it must be quite stunning. The whole trip was initially planned to continue onto Ranthambore National Park, one of the most celebrated National Parks of the nation. Since I belong to the 99% who have to work to make a living and since “work” has this bad habit of showing up when it is least conducive, the trip had to be split into two. Eight or so months ago, we had done the part-A of the trip to Ranthambore. Unfortunately, the trip turned out to be only a foot-note worthy. After chasing the tiger for a week, all we managed to do was cover ourselves with dust and scare a few Deer and Peacocks away. I spot far more wildlife from the comfort of my bedroom window. Click here for more photos from Jaipur. Click here for more photos from Ranthambore National Park.